Personality: Protects creatures who are smaller than her. Cares for any creature who doesn't have a family or can't protect themselves. Curious about new things. Open to making new friends. She loves to have fun and play with other dragons. Tries to break up fights that might end up in bloodshed. She only fights when it is the last resort. Fears: SPIDERS and venomous snakes. History: An egg laid on a roadside far from its nest. This egg was no ordinary bird egg, but a large dragon’s egg. This egg shook like some creature was wanting to emerge from its hard exterior but soft interior. This creature is what some might might call a dragon hence it being a dragon’s egg. The little dragon or “hatchling” as hatched dragons are called finally figured out how to get through the egg. The hatchling broke free of her egg after a bit pushing. 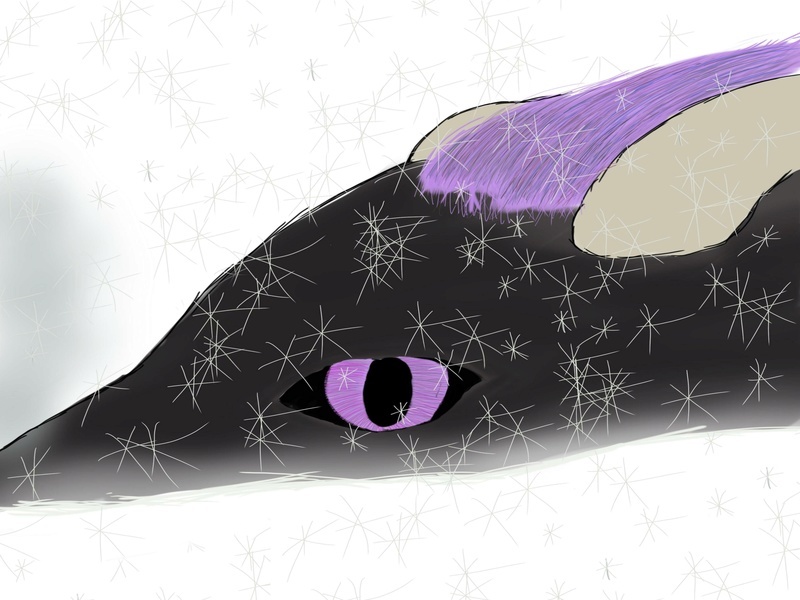 Her scales were of a deep black with a dark purple shine to each of them. Her wings opened showing the deep purple sheen. The onyx colored dragoness crawled out of her egg. Her legs getting used to standing. She opened her eyes for the first time revealing her eyes to of blue and purple hue. Her vision was strange to her at first, she could only see balls of light moving. She closed her eyes and opened them once more, the orbs were gone and she could see the trees and animals clearly. She admired this gift. The dragoness didn’t know how to take care of herself, let alone how to hunt. The name she choose for herself was one she felt a connection with “Fury”. 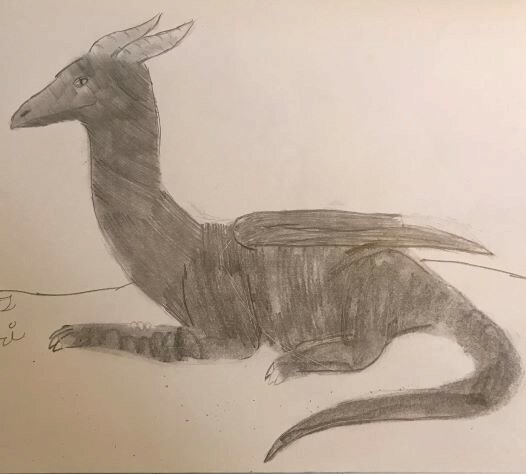 The onyx colored dragoness roamed the land, trying to find a place to call home. Fury, searched until she found a cave that was the right size she was looking for. A huge cave where she felt safe inside. During her years in the cave, she built a place to sleep, a large hole in the ground she dug. Fury lined it with all the sheep wool she could find or take without the sheep noticing. She filled the whole hole with the wool and then patted it to her liking. She had all the materials that could keep her alive ~ food, water, place to practice flying and a place to call home. Scale/Fur/Feathers: Scales are Russian purple in color. The mane is made of thin Amethyst colored flames. Horns/Spikes: Two horns locate on the top of her head. Look like stretched out SS. Their color is sandstone. Abilities: She can use shadows as cover. She can see and communicate with the souls of creatures who have not past over. Soul Walk- her physical body can not move on its own while her soul out of it, She can only leave her body three times a day. The amount of time she can stay in this forum is five hours leaving her with three hours each to reconnect her soul with her body. She is partly visible being somewhat see through. Fury's soul can travel in the range of 10 to 100 mph. Her soul can shrink to fit through cracks in walls. Her soul can hear but it's sorta muffled. Her soul can communicate but only by writing what she wants to say. The maximum distance she freely move away from her physical body is 1000 km. A down side to her soul walking ability is that if any harm comes to her body her soul will feel that harm. If her soul gets scraped or cut, that scrape or cut will appear on her body. Strengths: Quick in her movement. Weaknesses: Over confident when it comes to fighting off larger creatures than her. Gets overwhelmed when there are too many souls communicating to her at once. Fighting Style: Good with aerial combatants prefers short ranged combat. Majority of it looks good, though some things need to be changed. You don't really need to state her ability to fly unless it's important. "Special abilities are unique things that your dragon can do, like breathe a sleeping gas, generate electricity, breathe fire, ect." There are no demons/angels, humans or deities that exist within the lore of Nuira. The lot of it is currently dominated by dragons and your usual wildlife. Alright, last thingy-doo, and you'll be all set! "Her soul can leave and renter her body at will." I'm assuming she can't move her physical body in this state? Would there be a limit of how many times/how long she can stay in this form? Would she have the capacity to move through walls/possibly hear or even communicate with others in the physical world? Lastly, is there a certain maximum distance she can move freely away from her physical body? Personality: try being more descriptive of what your character is like. It needs to be at least five sentences long, and one-word statements aren't a sentence. Abilities: How fast can she move in her soul walking state? Is she visible in this state? Can she be harmed/hurt? Also, saying she can only do this 3 times a day, staying out of her body for 8 hrs at a time... thats 3 x 8 = 24hrs a day which means forever. Bump when explained/changed or I will put spiders on ye!